LAWRENCE – Visual art faculty will exhibit their work in a show starting Nov. 16 at the University of Kansas. The exhibit will kick off with a reception from 2 to 4 p.m. Visual art faculty exhibit artwork across the United States and around the globe, and this exhibition is an annual opportunity for them to share their creative research with students, KU and the community. Each member of the faculty submits one or two pieces that demonstrate the creative range of the artists and scholars of the Department of Visual Art. This year the work of Associate Professor David Vertacnik, who is retiring in the spring, will be featured. 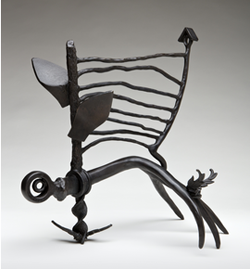 Vertacnik has taught ceramics at KU for 37 years and has exhibited artwork in the United States and Most na Soci, Slovenia, where he has three sculptures permanently installed. A range of disciplines will be represented, including ceramics, drawing, expanded media, jewelry/metalsmithing, painting, printmaking, sculpture and textiles. The exhibition is free, and the public is welcome.